On Oct. 26 I bent over to move some small tree branches out of the way; after I did that I leaned my trunk over my right leg and stood up. Piercing pain shot a short way up my right side of back and down my leg so much so that I almost fell down. I couldn't move or walk. Went to a Chiropractor initially and he saw me every day (except Tues.) for 5 visits and I changed Chiropractors because the first one was not addressing the problem. The pain is constant and incredible - brings me to tears. I can't sleep, can't get comfortable no matter what position I am in. I have numbness of the right anterior thigh both medially and laterally. Pain down the right groin. I am being treated by a different Chiropractor who adjusts the lower back on my side with my one knee up and twists the area. I am 46 and I have a history of degenerative bone disease in my family, and I have osteoarthritis, scoliosis and 2 herniated discs from a car accident in 1998 (1 is at c5 and the other at L5), and the x-rays from this injury showed some compression between L5 and S1. The current Chiropractor is saying that it is most likely the rotation of the discs at L1 and L3 which both of mine have been out and continue to slip out (so I assume the impingement is continual which is why the pain and numbness is lasting so long). This Chiropractor is also tractioning the legs as he discovered my pelvis was also rotated and likely causing an impingement...that is dong better. The pain still persists and is driving me crazy! I am taking tramadol for pain and ibuprofen for inflammation every 6 hrs. and I usually can't wait for the 6 hrs. to be up. Does this sound like the issue is being corrected and I just need to stick with it and grin and bear the pain until it calms down? Or has the issue not been addressed properly, which is what I fear and further nerve damage is occurring?? What can I do to make the pain stop??? I use ice and it helps, temporarily, I use a TENS unit and it helps somewhat and temporarily, I mentioned the meds and they take the edge off the pain, I find myself flat on my back in bed most of the time for the most comfort I can get, but I cannot live life like this!!! I am even resorting at times to punching the groin area and the thigh to relieve the pain temporarily, at this point I really don't care I just want the pain to stop!!! If I stay absolutely as still as possible in bed, it relieves it some, but the minute I make any movement the pain is back. Please, any suggestions would be greatly appreciated. Yes, incredible pain, I've been there myself, so I know you aren't exaggerating. Femoral nerve damage ... It hurts. Do you have more leg pain than back pain? 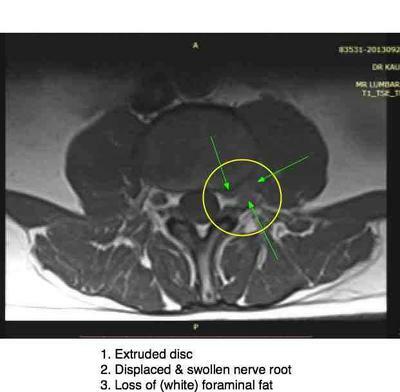 If so you may have an extruded, or sequestered disc which is a very serious condition. The thing to look out for is whether the quadriceps muscle is getting weak. Stand on your left leg, and gently bounce on the knee. Now repeat on the right leg. Does it feel like the knee is going to give? Feeling weak on the stairs? Then, prick your legs and as accurately as possible try and find out where it's numb. It helps determine the level. Is the knee jerk reflex diminished? Hopefully it's been tested, and should continue to be tested. It's now three weeks. Are you any better at all? It sounds to me like it's time for an MR scan. It's the only way to determine exactly the level to treat. Depending on whether the extrusion is far lateral into the foramen, or more central, pinching different nerves, it's very difficult to be absolutely sure one is treating the right level. Yes, it's expensive. My own daughter is a chiropractor, so I had optimum care. A little tip that you might like to share with your chiropractor. We have been using a "drop-roll" technique, lying in the side-posture you describe, but with no true cracking sounds. A gentle drop in the side-posture. That's what worked best for me. She did it bilaterally, L3 on the right, and L5 Left, but yours of course will be/ may be quite different. What also really helped was lying on my side and doing soft tissue therapy down the leg. The leg itself becomes extremely tender following the Femoral nerve path, and massage down the leg, ice too as you are doing, really helped. In short, Jeanne, you have a serious condition. Take it seriously, and do your part. Be careful, don't sit, don't garden, nothing silly, try not to sneeze. I would recommend an MR but your chiropractor will advise you about that. It helps make the diagnosis. Adjusting the correct level is vital. Good luck. I hope this contributes, a difficult condition, especially when it hurts at night. I know...! Let us know in a couple weeks how you are getting on. Perhaps print this out and take to your chiro if you think he might appreciate it.